Is your motor insurance expiring within the next 3 months? Fill up the below form to get the lowest priced quote from us! You must be the registered owner of this vehicle. Please enter the carplate number of an existing vehicle that is due for renewal. We will help you to check if you are eligible for Offence Free Driving (OFD) discount. 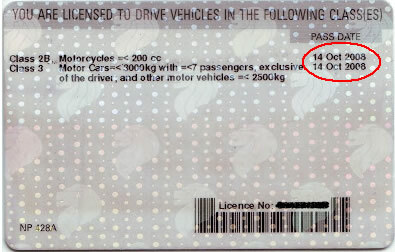 You can find the driving license pass date at the back of your driving license. Fill in your best guess if not sure of when your insurance is expiring. Please enter a valid Singapore contact number. It should have 8 digits and should start with either 6, 8 or 9. Please input the No claim discount (NCD) you will be entitled to after your current insurance has ended. Please provide a valid email address so that we can email the quotation to you once it is available. I give consent to SgCarMart & its insurance partners to contact me on matters related to my insurance. You will receive your quote within 1 working day if your insurance is due in next 3 months. Otherwise we will contact you 3 months before your insurance expires. If you're confused about the terms NCD, excess and named driver, fret not. Here's a breakdown on what each term means and how they work.